Jay Sullivan joins me at a taproom table and sets down a bottle of Real Friends. He flicks open the bottle, then lines up three glasses: one for himself, one for Sean Nolan, and one for me. The beer is a grisette, a Belgian-style farmhouse ale similar to a saison, which has been aging in oak barrels for over a year. Sullivan and Nolan co-own Honest Weight Artisan Beer in Orange. Thanks to them, Real Friends is just one of many barrel-aged beers that this north-Quabbin brewery has been turning out since it opened in 2015. As the beer flows, it catches the afternoon sunlight pouring in from the large windows in the brewery’s taproom on West Main Street. Nolan joins us, and we each raise this liquid gold to the light, where it shines bright after many months spent in darkness. 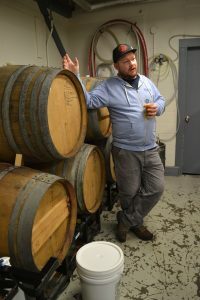 Jay Sullivan, co-owner and brewer at Honest Weight Artisan Beer, gives a tour of the Orange brewery’s 24-barrel cellar. Hunter Styles photo. 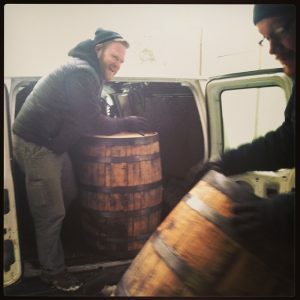 Sullivan and Nolan, together with staff brewer Kyle Warren, have made barrel aging a central mission of Honest Weight. What goes on inside those barrels — and the reasons why different styles of beer are more suited to aging than others — has always seemed to me more like magic than science. I suspect it’s both. And these brewers’ successes thus far have required some skills that might seem to contradict each other: an obsession with precision and an appreciation for nuance, sure, but also a willingness to discover what the barrel can do, and to let it surprise you. Honest Weight will celebrate its three-year anniversary with a party at the tasting room on Saturday, November 10. That event kicks off at noon with exclusive beers on tap, local food vendors including Athol’s Soup on the Fly, and a dance party starting at 8 p.m. featuring local DJ Just Joan. But I’m most excited about the special bottle releases that Sullivan and Nolan have planned. Now that Honest Weight has been around for a few years, it’s starting to show its age — literally. Visitors on November 10 will be able to head down the hall, past the tasting room, into the barrel cellar, which will open as a pop-up shop to sell a new and vintage collection of barrel and bottle-aged beer. I stopped by in advance to get a sneak peek at the cellar, and to learn about barrel aging, which has become much more popular in American craft beer over the past few years. How do Sullivan and Nolan turn an already great beer, like their Gate 37 grisette, into a mature mixed-culture brew like Real Friends, which is toasty, tart, and filled with rich notes of of apricot, cherry, and peach? Sean Nolan, co-owner and brewer at Honest Weight Artisan Beer, checks the barrel cellar at the brewery in Orange. Hunter Styles photo. Although Sullivan and Nolan go way back — they worked alongside each other at Cambridge Brewing Company for years — the Real Friends grisette is actually named for the barrels themselves, specifically the four barrels that contributed to the final product. Blending barrels is one trick brewers have up their sleeves as they work toward a perfectly aged beer. We head into the cellar, where Sullivan and Nolan currently keep about two dozen barrels. All are full of beer, as are a few additional barrels in the building. They recently filled some rye whiskey barrels with a rye old ale, which will mature into something like a light barleywine. They have bourbon oak barrels, white wine barrels, and red wine barrels. One beer that won’t see the light of day until 2019 — a lightly smoked Bière de Garde made with maple syrup from Petersham and stave-smoked malt from Valley Malt in Hadley — just went into a combination of pinot noir and syrah wine barrels. Although Honest Weight makes a number of pale ales and IPAs, those hop-forward beers don’t typically make it into barrels. 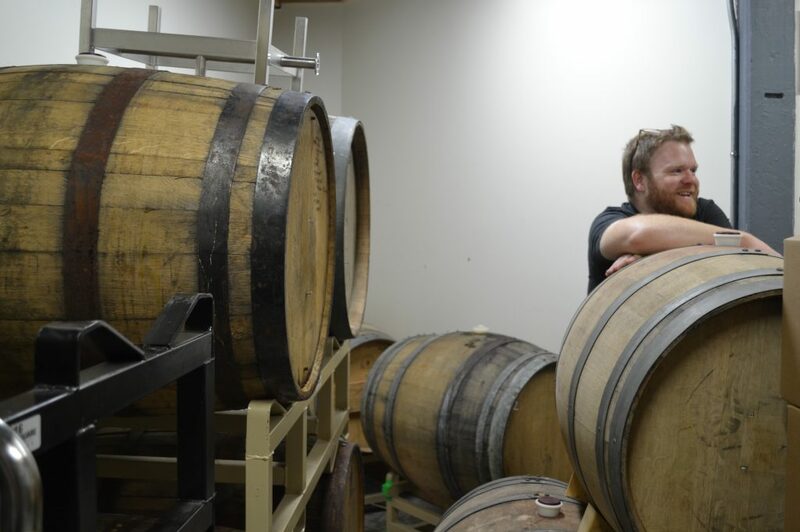 Sean Nolan (left) and Jay Sullivan, co-owners of Honest Weight Artisan Beer in Orange, received their first bourbon barrels in 2015. Instagram photo. While we talk in the cellar, Nolan uses a hand-bottled spray to sterilize the area around a stopper in one of the barrels, then pulls out the stopper and peers in at the brew within — and at the yeast drifting on the surface of that dark boozy world, like a little Pangea. 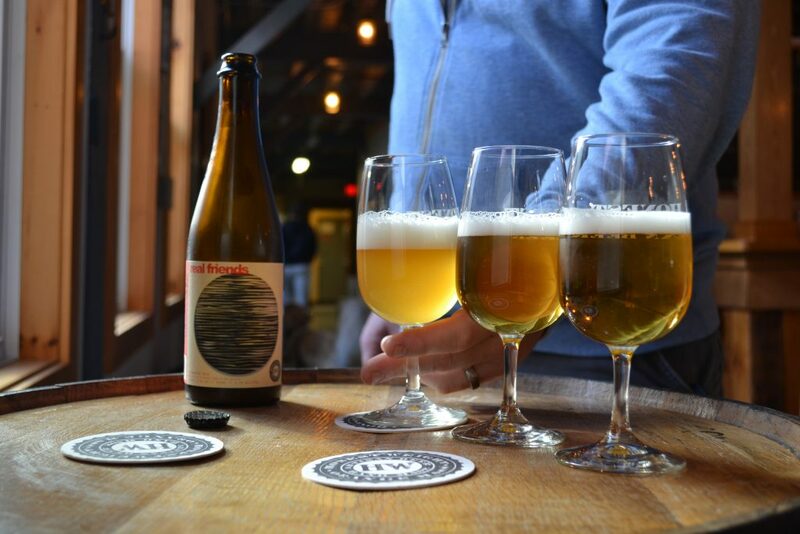 These organisms, mainly brettanomyces yeast and the lactic acid-producing bacteria pediococcus, break down sugars and yield more complex flavors in these beers over time. It’s a two-way street: the barrels influence the flavor of the beers, but the yeast and bacteria that take up residence in the staves of each barrel affect the flavor of future beers put into those barrels. Fill three barrels of the same provenance with the same batch of Gate 37, and the result will be three different aged beers. Trace notes can go a long way. 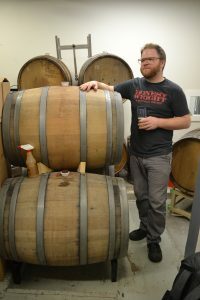 Honest Weight recently aged its Bière de Garde in wine barrels for ten months, and Nolan says that the resulting beer, called Roman Mars, has appealed to visitors who love red wine but don’t drink beer very much. One recent taproom customer who especially likes pinot grigio found that Swift & Changeable, an aromatic dry saison, hit the spot instead. Co-brewer Warren is usually party to these tastings, as are other staff members and trusted friends. That array of feedback is important, especially from beer fans less fussy than Nolan and Sullivan. After all, it can be hard to make a crowd-pleasing beer if you can’t see the forest for the oak trees. In Nolan’s terms, I suspect that I’m still a boombox. But a great tune stands out anywhere, and a great aged beer will treat craft beer newbies well, too. If that terrific glass of Real Friends is any indication, I should have no trouble following the notes. The Beerhunter appears monthly. Contact Hunter Styles at hstyles@valleyadvocaete.com.